I also added this post to a Pinterest Challenge Link up over at YoungHouseLove, so check out all the other people who have decided to stop pinning and start doing!! Anyway, I saw this cute wreath that was basically a wreath form wrapped with a black and white polka dotted ribbon and tied with an orange bow. Frances is always bugging me to decorate for all manner of holidays and Henry's soccer gave had been cancelled due to rain, so we headed out to the craft store. I bought our supplies and set up a craft station at my dining room table. I thought I would photograph the process, so someone else can try it out. We had a lot of fun!! 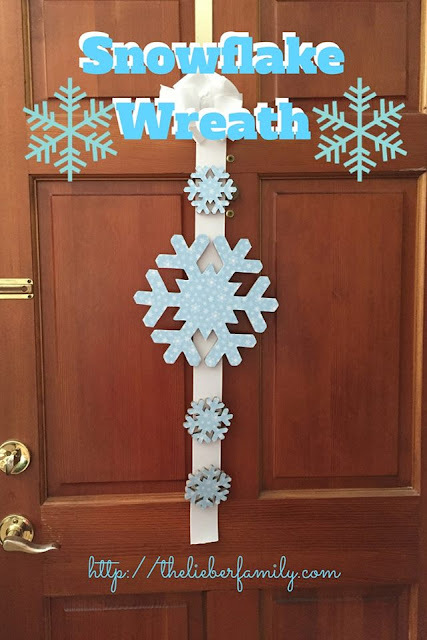 Ribbon--the amount you need will vary by the size of your wreath and the width of the ribbon. I think our wreaths are 12" across. We used two spools of the thin ribbon for each wreath. First I glued one end of the ribbon to one flat side of the wreath. This is now the back side of the wreath. Then I wrapped the ribbon around, leaving space as I went. When I got all the way around to where I started, I glued the ribbon down on the same side and clipped the excess. The I took a second, coordinating ribbon and wrapped it around the same way, filling in the spaces. I glued the ends of this ribbon in the same way that I glued the first one. Then I gave the wreath to my 18-month old, who, with some help from his big sissy, put seasonal stickers on it. I repeated the same process to make a green wreath for Henry, 4. At 8, Frances was old enough to do her own. She had picked out purple spider ribbon for hers. Hers was not wrapped perfectly, but that wasn't my goal, so it didn't really matter. Plus, adding the stickers filled in the white spaces. Then I used some of our left over ribbon and and glued the wreaths together in sequence and hung them on the front door. The kids all had a great time and were so proud of their contribution to our Fall decorations. How cute! I might have to try this when my son is old enough to do crafts.